to for some of the anon or "no-reply" peeps. Please just know that I appreciated every single one of them. Now, to yesterday- the mail lady brought 2 packages to the house! 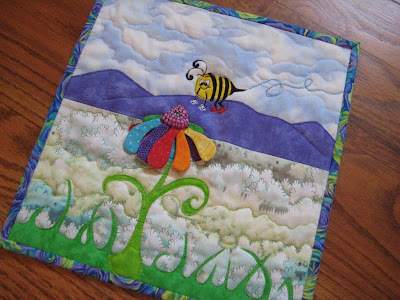 One was a quilt book I had ordered thru Ebay, saving over $10, which I liked. It's "Greetings from Tucsadelphia" by Lizzie B. Cre8tive. 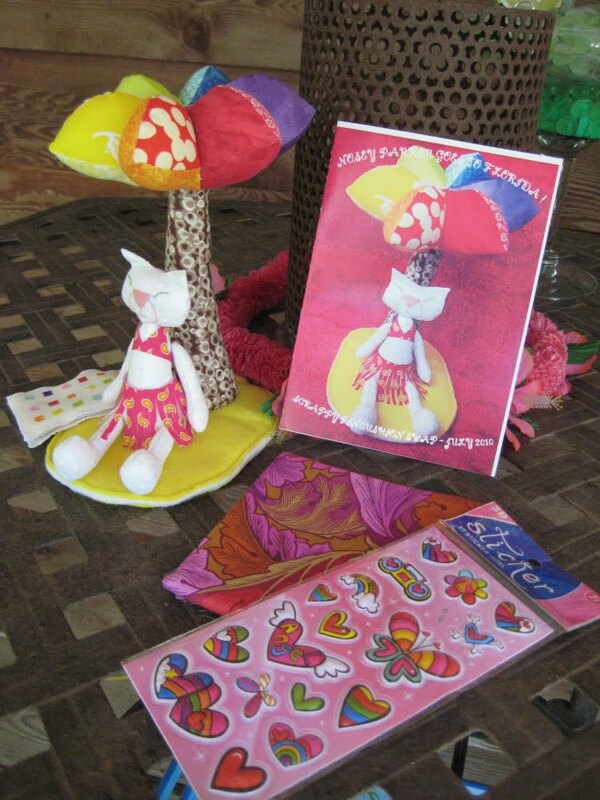 It's got lots of fun applique patterns in it and even a recipe or 2. 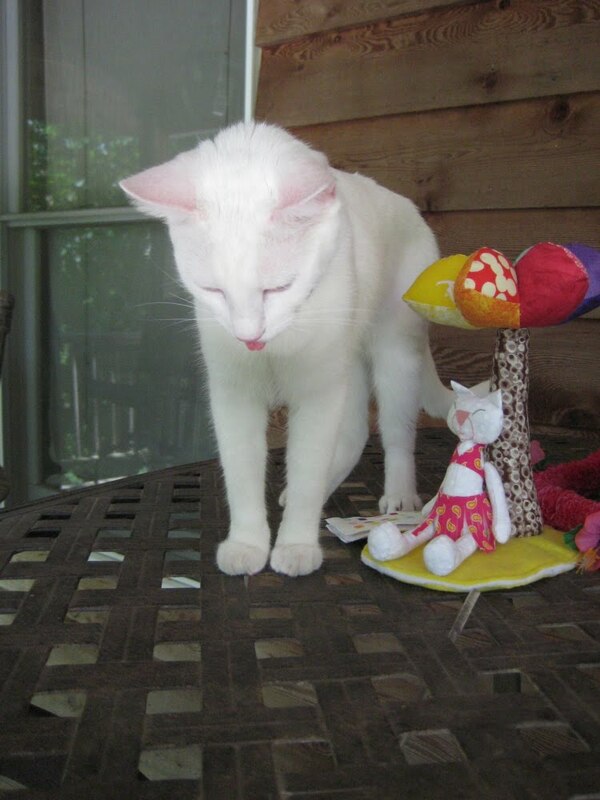 But the other box- well, let's just say "WOWEE WOW WOW", shall we? It came all the way from Buenos Aires, Argentina from a friend named Sandy. I didn't know it, but she had my name in a scrappy pincushion swap over at Flickr! I made and sent the turtle, remember? I thought that was cute. Sandy taught me all about CUTE with a capital C! 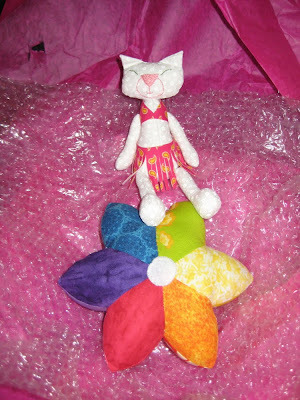 This is what I found when I opened the biggest package in the box- a little white cat in a pink bikini and a rainbow colored pincushion with a velcro dot in the middle. Interesting, yes? Wonder what that velcro is for? OH! It's to attach it to the next largest piece in the box, turned out to be a tree trunk on a piece of sand! Now, tell the truth- is this not the cutest thing EVER????? Sandy made me a little miniature Nosey Parker Goes to Florida pincushion set! It's a rainbow palm tree on a bit of beach! Un-freakin'-believable. She even has her own little towel which doubles as a needle case. Sandy made this up all on her own, she had no pattern and she had to work it out so that it was sturdy and would support the tree top and built it an underwire frame and everything. This was no easy feat! I am so totally impressed. And grateful! She also sent me some fabulous Kaffe Fassett fabric, 3D rainbow stickers and a lovely handmade, custom card with a long hand-written note about how this came to fruition. You wouldn't believe how giddy and happy I was- I needed this morale boost- it showed me what a lovely friend Sandy is to me and what a kind and dear lady she must be, to go to all this trouble for me! AND- I got what has to be the best pincushion in the entire swap. For size perspective, you can see the real NP checking out her newest competition. The little fabric NP is quite tiny and so dear! I just love this and keep pinching myself because it's so dreamy. I love things with pieces parts, I adore things that are rainbow colored and I love all things tropical. And of course, I love Nosey Parker to bits, so you tie them all together into one package and I damn near fainted! I tried to stay busy last week, to distract myself and I ended up finishing 2 little quilts. No bees, no honey..... No work, no money..... that's a saying from somewhere, don't know where, but I like it. 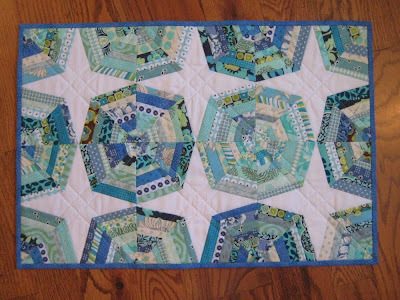 :) It's also the name of this little quilt. It measures about 12" square and is for me and the other one, below, is for the Doll Quilt Swap. It's about 24" x 16". 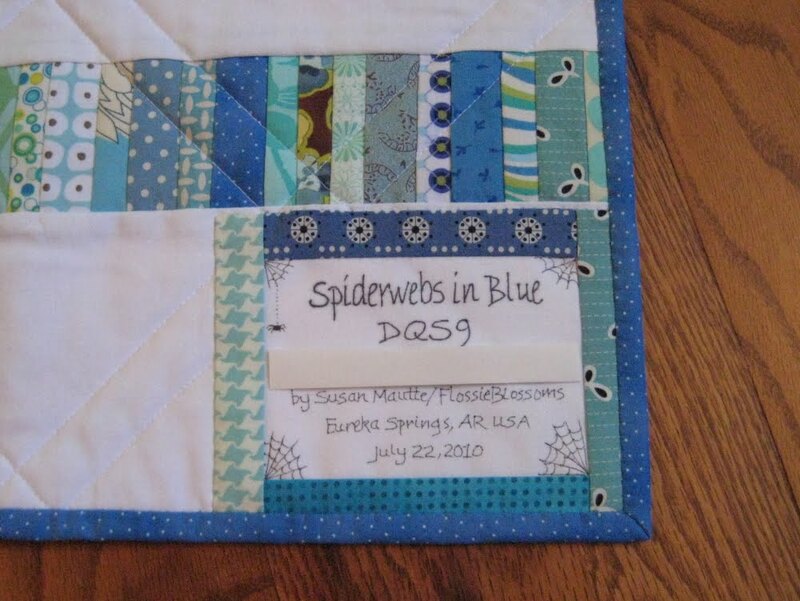 It's called a spiderweb quilt. The recipient's name is blocked out so she can't accidentally find out that it's for her before it arrives in her mailbox in about another month. And what's a spiderweb quilt without a spider? :) Don't freak, it's rubber and squishy and fun to squeeze. This spider is my friend, he eats scary snakes! I also finished up 9 more sewing caddies and they're all in my Etsy shop. And I made 9 cat collars, but that was no big deal. Murphy and Parker both lost one this week, those rotten kids. So this week has been better than last week. Thank you all again, very much, for the kindness you've shown me. The new pin cushion totally rocks! I love how your cat is in a bikini! Oh. My. Gosh. That pincushion couldn't have been more YOU if it tried! Just fabulous - what a lovely friend Sandy is. Cute as a button. Speaking of which, how brilliant is that wee bee quilt?!? Clever girl. What a cute pin cushion! Amazing really. Especially enjoyed the photo of the real NP with the stuffed one. The really do look alike in the face. Very funny! That pincushion is more than just CUTE, it is absolutely, freaking ADORABLE. To say nothing about being totally AWESOME. 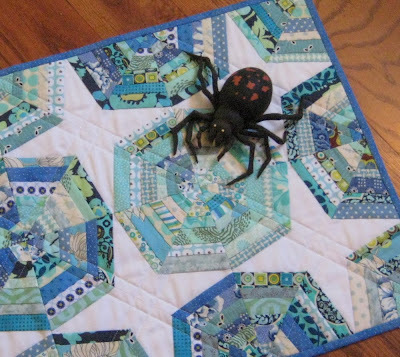 Great quilt, keep the spider, and my sympathies about Paisley. You are a lucky recipient of some great YOU stuff! Well Sandy really had you sorted. This is just adorable and so perfect for you. Lovely to get a gift in the mail when you need cheering up to. Love your little mini quilts too! Such a great quilt! I love it!! !